Today’s photo highlights a 3D pipe reactor. A pipe reactor is an acid-base reaction vessel used in the production of inorganic fertilizers. Phosphoric or sulfuric acid is fed into one side of the pipe, and gaseous or liquid ammonia is sparged into the reaction chamber. This results in either ammoniated phosphate or sulfate hot melt material. The hot melt is then sparged into the rotary granulator onto a bed of material. 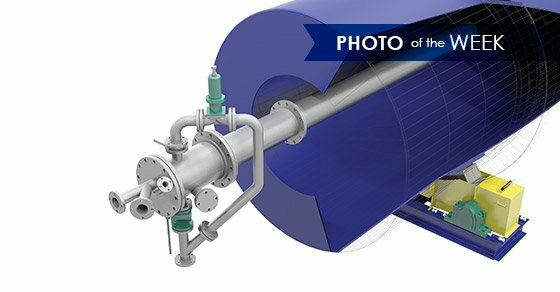 While the pipe reactor is not applicable in all operations, it can offer significant savings in energy costs. The contained heat of the reaction from the pipe reactor contributes to the heat requirement for moisture removal from the granulated material. This reduces the dryer fuel requirement for the operation at hand. Finally, the pipe reactor can be designed into a new system, or easily retro-fitted into an existing system.